I’ve been away from blogging for a while. My mother went into hospice last April and passed peacefully away surrounded by her family. I needed a lot of time to grieve. I’m still very sad and there’s still a lot of stuff to do, but I wanted to get back to some things I love to do. One of the things that remind me of my mother is tea. She tried many kinds and always went back to Liptons. She drank a lot of tea! When I was a kid, she drank coffee with cream and sugar. When she started teaching during my junior high school years, she switched to tea. Story was, that the teachers she hung out with, charged 50 cents for a cup of coffee but tea was free. Fifty cents was a lot of money for a cup of coffee, so she switched to tea. And loved it. She never went back to coffee. I love a good cup of tea and I like variety. I’m not a purist, I just like what I like. To me it’s a mini-retreat in the midst of a busy day. Tea is also a pick-me-up and an oasis. I am trying to give up diet soda and now tea is my go-to drink. Note: I gave it up for several months but after several long car trips, diet soda was the easiest. So I will be switching back to tea. Tea often gives rise to reflections, divination and “deep thoughts.” Sometimes, though, a cup of tea is just a cup of tea! Whatever the moment, it is refreshing. I read somewhere that starting with a spicy drink, such as pepper, cinnamon, or similar tea, can boost your metabolism and help you towards better fitness. I have several and sometimes I think it works. Today’s tea is from serendipiTea and is called Sssssspicey, and is an “organic Blend of Cinnamon, Ginger, Clove and Black Pepper.” Technically, it’s a tisane since there is no tea in the blend. It is wonderful and VERY spicy. The blend gives you both a foretaste and a nice afternote. The spices are very aromatic and just smelling it is an energizing experience. It certainly is an invigorating tea for a Monday morning at work! It is definitely effective. I have gotten a lot done this morning. As you can see, it’s a loose blend. 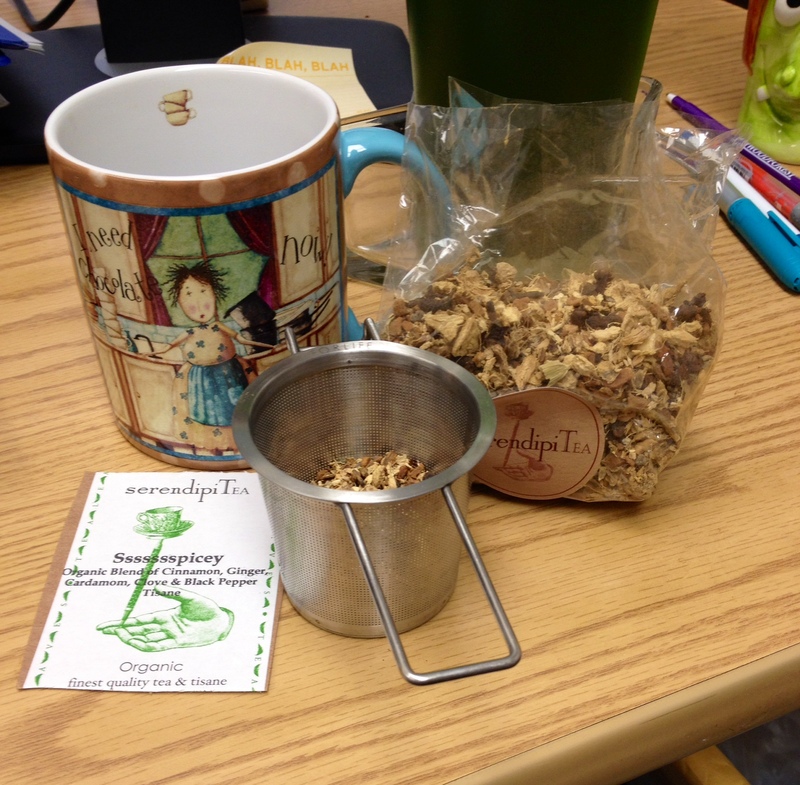 As I was sniffing it, I dropped the tea strainer into the brew and my cup was awash with the leaves and bits of herb. I had to strain it again. The tea did not guarantee grace or a spell against clumsiness! Even after I finished the cup, the scent lingered on. May your Monday be an energetic delight, and end by relaxing into sereniTEA! Tea, Hot Water and the Rowdy Goddess! This quote, attributed to both Eleanor Roosevelt and Carl Sandburg, attracted my attention because I want to write a book on the Magick of Tea; so I collect information, lore, superstition and magical attributes of tea. If I had included it in the Crone posting, I’d be making smart-aleck remarks about old bags. Another day for that! Tea is wonderful not only for its flavor, aroma and health benefits, but because its history is also so rich. The history of tea is full of legend, corruption, and political intrigue. The tea trade was enormously influential in the history of Europe and the history of its land of origin, China. And always, when I’m researching something, I’m looking for the Divine presence in the lore and uses of it. For tea, topping the list is Kuan Yin, the bodhisattva of mercy. Some people will be quick to correct you and tell you that She is not a Goddess. To me she is, and she has been revered in such a way, that she is a goddess. Her mercy and compassion speaks to everyone. The oolong tea, Tieguanyin Oolong Tea is named for her and is one of the most prized teas growin china. How it became named for her is a beautiful story of devotion. Centuries ago, there was a tea farmer named Mr. Wei. He was very poor and worked very hard to create a living for his family. Each day, both morning and evening, he would pass a neglected temple, the Temple of T’ieh-Kuan-Yin. The degraded state of the temple awakened his devotion to Kuan Yin and he began to light incense and pray at the temple; each day doing a little clean-up and polishing of the temple and the statue of Her. Moved by his devotion, Kuan Yin appeared to him in a dream. She said to him, “Beind the temple, deep in a cave is a treasure for you and the generations to come. You must share it with all of your neighbors.” Upon awakening, he rushed to the cave and searched and searched. He found nothing be a small sprig of tea. Unhappy that he did not fulfill Her instructions, he took the sprig of tea back to his home and planted in his garden. He tended it and it grew over the years into a bush. He noticed that as he created infusions that the fragrance was beautiful and long-lasting. He began to cultivate the tea bushes and shared the shoots and seeds with his neighbors, naming the tea after T’hei-Kuan-Yin. The temple was repaired and funds were set aside for its perpetual upkeep. The region flourished as tea traders flocked to the region to buy this lovely tea. Kuan Yin inspires devotion all over the world from traditional Buddhists to the pagan and Goddess communities. She is the embodiment of compassion (Karuna) and mercy. 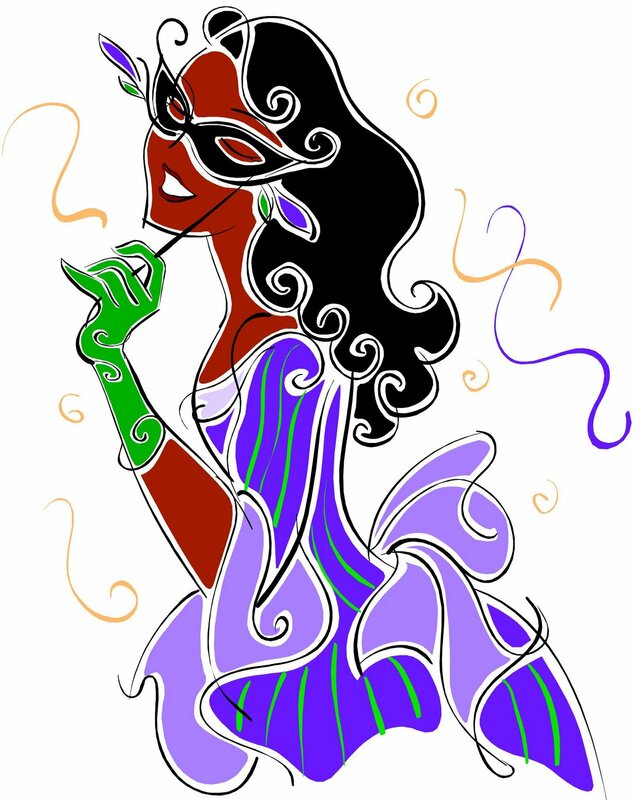 She is Mistress of the Southern Seas and is often depicted riding across the ocean either in a lotus or on a dragon. She holds a vase with the nectar of compassion and wisdom, and she is also shown with a Willow branch from which she sprinkles the divine nectar of life. 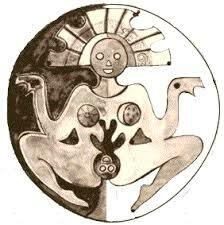 She is the bestower of children and the dove is the symbol of her fecudity. She is also shown with a book or scroll of prayers, representing her mastery of dharma (teaching) and text (sutra). She is shown with a rosary which she uses to call on the Buddha for succor on behalf of all who call her name. People tend to look at her as very holy and without fault since she is deserving of nirvana and chooses to stay and help others achieve enlightenment. She has been in my life since I was a girl. My great-aunt and my grandmother collected images of her, referring to her by one of her other names Mei-Ling. When my grandmother passed away, I inherited her collection of figurines along with her love of this wonderful Goddess. Whenever I do Reiki healing and teaching, Kuan Yin is the Goddess who appears. To me, though, there is an element of playfulness about her. She isn’t completely somber and serious. In my work with her, I’ve learned she enjoys a good joke, likes physical exercise and loves cats. Her mastery of dragons resonates with me and tells me that her strength comes not from holy stillness but an active, strong physical presence. She is vibrant and vital as she appears to me. For my birthday, Mouse gave me a wonderful Kuan Yin pendant from Jane Iris [www.janeiris.com] that is shown in this blog entry. I love that she has perky breasts and tips her hip’ she looks saucy! A boddhistava that wants to have fun…..It shows me that Kuan Yin has her connection to the exuberant, ecstatic flow of energy in her being and she continues to communicate that fabulous energy to us. So every time you breathe in the delicate fragrance of Oolong tea, find the essence of the Goddess there as well. There a lots of varieties of tea, and oolong is a delicate variety somewhere between black tea and green tea in its oxidation. The flavor is somewhere between black and green, favoring the green without the grassy taste of green tea. Oolongs flavor has many sides beginning with a strong almost bitter taste with an afternote of sweetness. The term oolong means “black dragon” or “black snake” because its leaves look like little black dragons when you pour hot water over them. Oolong is said to enhance meditation. So settle back with a nice cup of tea and meditate on Kuan Yin in all her compassionate mercy and sassy rowdiness.